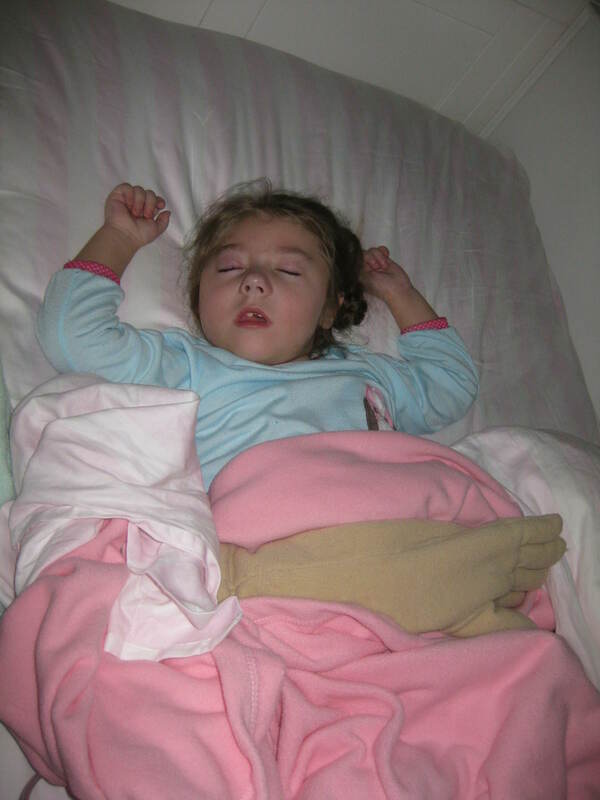 Reagan woke up a few times last night but went back to sleep on her own each time. Whew! Close call. 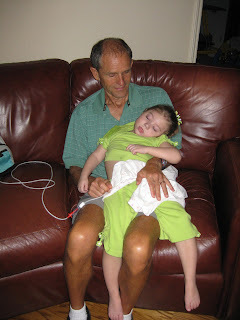 This morning she had an appt with the mitochondrial doctor. Her appt was at 10:30 but we didn't see the doctor until around 12:30! She was very apologetic and spent a long time talking with us, so I can't complain. We talked about Reagan's vomiting episodes. She's not at all happy that Reagan is having consecutive days of vomiting. She thinks we need to come up with a better game plan to treat her nausea/vomiting and to stop it in it's tracks (before it escalates to an entire day of vomiting). She thinks there are some undiagnosed problems causing it that should be addressed by Reagan's GI doc (who we saw yesterday and she had no suggestions or solutions). The current plan is to see another GI doc...one whose expertise is in motility and deals more closely with mitochondrial patients. We're also going to see a movement disorder doctor that is in the same practice as the mito doctor, to see if he has any thoughts on treating her chorea. 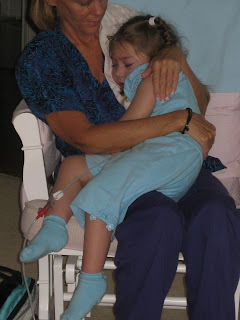 She agreed that a sleep study should probably be done and her office is scheduling that. She also mentioned some interesting DNA test results that we had never been notified of...a heterozygous mutation in Reagan's SURF 1 gene. 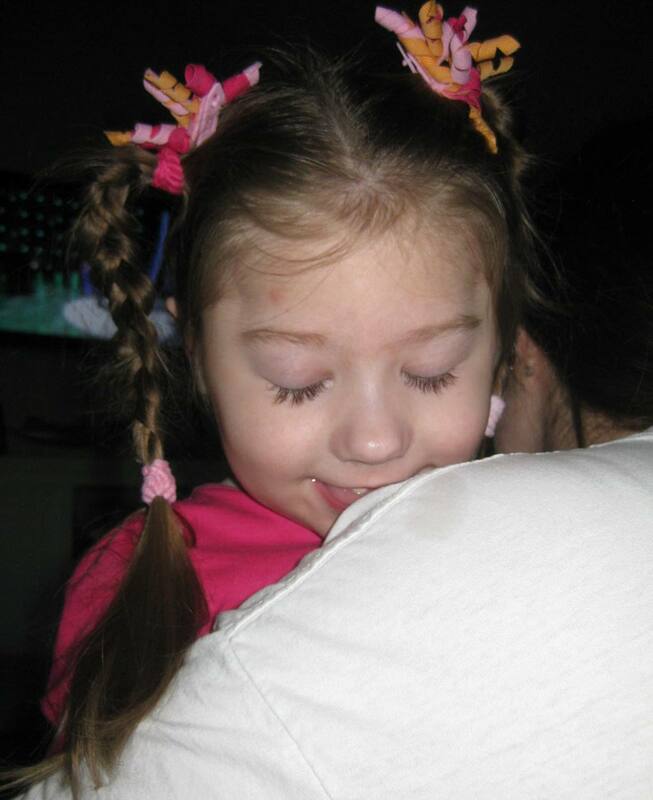 Reagan's specific mutation in this gene is not one that has been previously discovered so it makes it hard to say whether or not this means anything. Mutations in this gene have been associated with Leigh's syndrome...something we do NOT want Reagan to have (although she does have a lot of the symptoms of this disorder she does not have the MRI findings so that's good). They took blood from both me and Reagan (and Daddy as soon as we can get him to go) to look for this same mutation. If they find it in either me or Mike, then it is not a harmful mutation and it means nothing. If they don't...then it might be what is responsible for her mitochondrial disease. All in all, I feel like this was our best appt yet. I feel like the mito doc was really listening to my concerns and that she herself was concerned about Reagan, which is comforting. They even scheduled a followup appt with us 7wks from now, just to see how everything is going. Hopefully well. Reagan was great today for the appt. There was a lot of waiting and she was a trouper. She did cry out when she got stuck for the blood (which she usually doesn't do), but she got over it quickly (although she did cry again when I took her bandaid off). We rushed home and made it just in time for PT. Her therapist said she was really doing well on her tummy and side today and very responsive...pushing a toy over and over on her own. Then she spent an hour or so in the stander playing with her ipad. All of her therapists just love this thing. Reagan seems to like it too. Other than a little sniffly, snorty thing she's doing with her nose and some chorea in her hands, Reagan continues to do well. It's so nice to have good days for my girl...she doesn't have enough of them! Here she is watching a book on her ipad...and grinning from ear to ear! Last night Reagan actually fell asleep on her own and then slept the whole night through. She's been in another great mood today...very smiley and happy. She had an appt with her GI doctor this morning. She was happy to see how good Reagan looks. 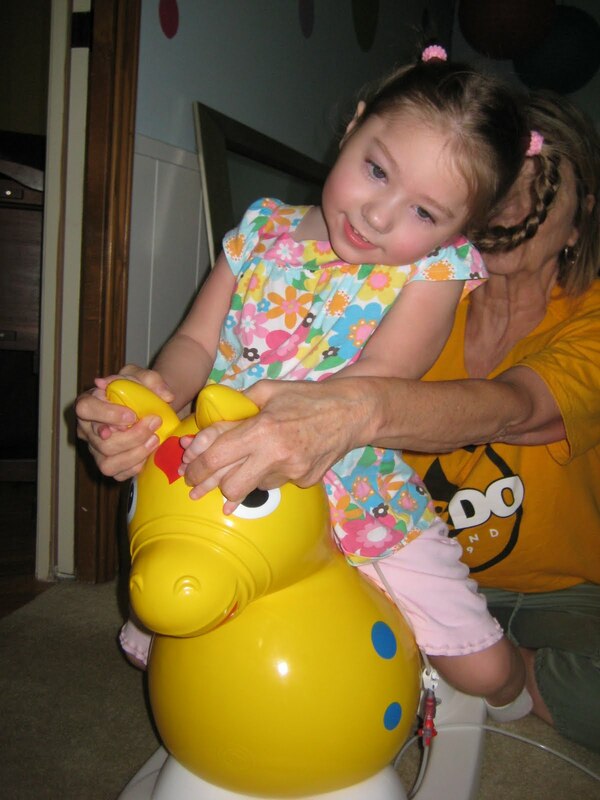 She was 60th percentile height and 68th percentile weight. Definitely not the skinny girl from last Christmas. 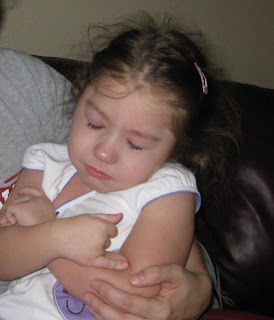 She thinks the vomiting episodes Reagan has been having fit the criteria of cyclic vomiting syndrome. They come on out of nowhere...she's horrible one day and fine the next. 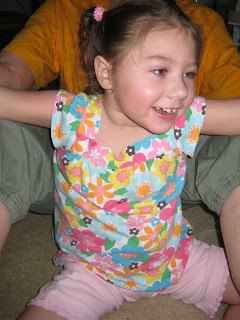 The doctor thinks we should continue upping her periactin dose when we see the nausea creeping back up. Problem is...periactin stops her from peeing. It's a known side effect of the medication, but for some reason it really hits Reagan hard. We've been giving Reagan 1/4 tsp each day for a while (the prescribed dose is 1tsp) and when she gets sick we increase it to 1/2 tsp. Just increasing it that small amount causes her to stop peeing. We have to give her lasix to get her to go. It's not like she's not making urine...she's just not releasing it! We upped her dosage last week and all weekend she wouldn't pee without lasix. I've since decreased her dosage back down but she's still not going on her own yet. What are we to do with this girl?!?! I wonder if we could prevent this nausea if we were able to give her the full recommended dosage. Who knows. 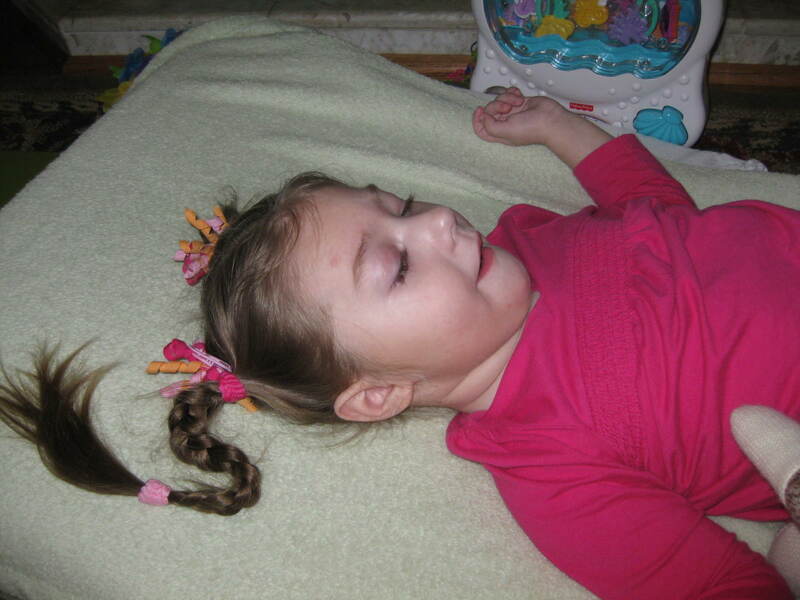 There are other medications they can use for cyclic vomiting syndrome, but most of them are all neurological meds that have the potential to interact with her seizure meds. Not something we want to risk at this time. Other than that, she seems to be doing well. Her hands are still moving a lot, grabbing at her shirt or at her hands/arms, but not so much that she's clawing or hurting herself. Tomorrow morning we've got an appt with the mitochondrial doctor. We're hoping to get her to work a little more closely with us in Reagan's care. I've got a whole list of questions ready to ask her. Hopefully we have a productive appt. Please continue to keep Reagan in your prayers...we need some more good days! Reagan slept through the night last night. Thank goodness because I was running on empty from the night before! She woke happy this morning around 8:15am and the smiles have been going strong all day. She was in such a great mood we ventured out to a birthday party (something we never do). It was Samuel's 4th birthday and I'm so glad we were able to attend. Grandma came with us which was a big help and we even took Reagan's positioning chair along (our first time to use it out and about). 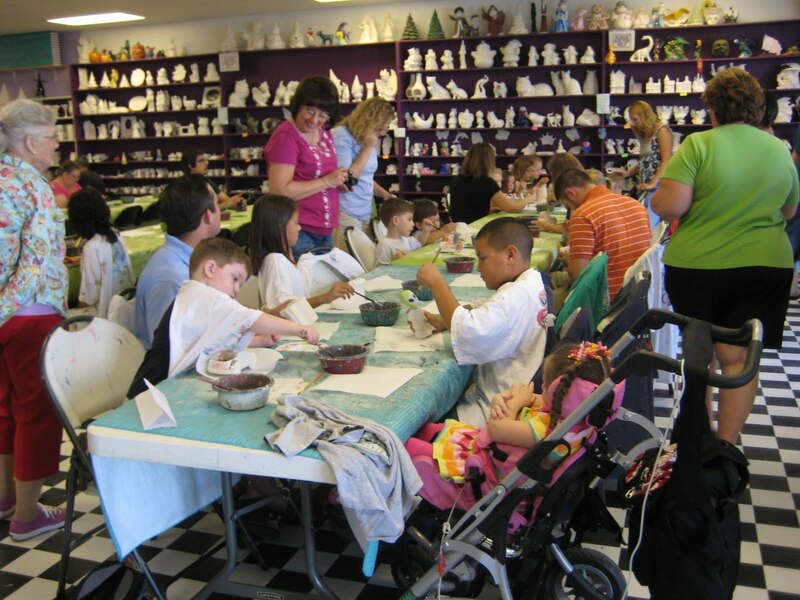 It was at a pottery place and all the kids painted their own piece of pottery. 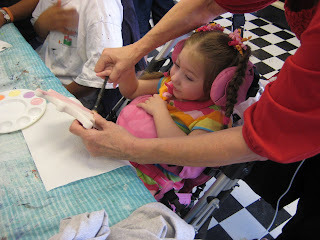 We picked out a little crown for our princess and Grandma helped her paint it pink. It took two tries to finally get a decent hand print on it. I can't wait to see it all glazed and ready to go. Reagan was a complete doll the entire time. All smiles (which is great because it was a 45min drive from our house). We really couldn't have asked for her to be any better and it was nice to get out and do something semi-normal. We rarely venture out of the house for anything other than a doctor's appt or therapy session due to our fear of exposing Reagan to germs, but Samuel also has mito and immune dysfunction so I was fairly confident there wouldn't be any sick kiddos there. It all turned out well and Reagan appeared to enjoy herself. She had a couple of mini meltdowns today (two for Daddy and one for Grandma)...I think she just got so happy/excited that she started crying. Sometimes you have to be careful not to get her too happy because next thing you know, she's in tears! Today I only saw one startle-like episode when she first woke up this morning. She did a few other questionable things when she was laughing hysterically, but I'm still hoping all of this is nothing. Neurological quirks we can live with...seizures we cannot. Please continue to keep her in your prayers. Reagan was up all night last night...only this time she was up laughing and talking. I put her to bed around midnight and the second I laid her down she woke back up. I laid down and and watched her on the video monitor, wide awake and moving around. I woke up at 1am and she was finally asleep. Then I woke at 2am and she was back awake. I got up and gave her a little more clonidine to see if that would help her go back to sleep. Then she kept making a weird grunting noise over and over. I picked her up and immediately she made a horrible gagging noise (but never threw up)...after that she seemed better. I laid back down and the talking began. She was saying all kinds of things. I listened to her (worried that she might gag again) and I just couldn't fall back to sleep. So I got up and laid in bed with her and she talked my ear off. Da! Ga! Ahhhhhh? It was so cute. Neither one of us ever went back to sleep. From what I can tell she got maybe 1hr of sleep last night. Not good. Despite that, she's been in a wonderful mood again today. Smiling nonstop. Laughing. So good to see her happy again. She's still super spitty and a little gurgly but it hasn't bothered her too much. I have seen something today that is a little disturbing. Quite a few times I've seen her throw her arms out to the side in what looks like a startle. For those of you familiar with Infantile Spasms, that's certainly not something you want to see. I'm not sure how many times she's done it, but a lot. The only thing is, if you're holding her with her arms held down, she doesn't do it. So I'm hoping it's nothing, but it still makes me nervous. Please continue to keep her in your prayers. She definitely needs more sleep so that she can fully recover. Grandma still needs her sleep as well. Mommy and Daddy are getting out of the house to go to the football game tonight (front row tickets to the Texans/Cowboys game)!! I said NO more throw up! Ugh. When are things going to start getting better? Last night Reagan slept three hours and then I got up with her from 1:45-4:15. She was quite miserable. Very moany and fussy...she was on edge the whole time. She fell back asleep but apparently woke an hour or so later and then just laid there in bed (Mike could hear her making noise but she never cried). I woke at 7am to find her still laying there wide awake and moving about. No covers but her entire back, hair, etc was soaked (with sweat, I guess). I picked her up and minutes later she threw up and continued to do so off and on all day long. Lots of throw up. Lots. No quite as frequent as two weeks ago, but close. And when she's not throwing up, she's making gagging faces. She's nauseous nonstop! We drained her g-tube (remember she gets all of her formula through her j-tube) and lots of fluid came out...clear foamy fluid and golden yellow bile as well. Since she's not fed into her stomach, she really shouldn't have much if any fluid sitting in there...except when she gets sick, things just stop working as they should and we find a buildup of fluid in there. I'm sure that's part of what's making her nauseous. Other than last night, she really hasn't been moany at all today. Just gaggy and beyond exhausted. Poor thing. You can tell she's just spent. She's exhausted but she can't sleep. Despite being up the night before, all day yesterday, most of the night last night and all of today...she still can't sleep! My mom is actually having a similar problem right now. She's only slept 5hrs (total) in the last 9 days. She called and spoke to someone at a sleep clinic and they sent her to the ER. Unfortunately they didn't find anything and they just sent her home with some Lunesta. Hopefully it works. My poor mom...she needs some prayers too. No one in this family is getting sleep! Do you think it could be genetic? Please continue to keep Reagan in your prayers, she still very much needs them. Reagan was up a good portion of the night last night. Half of it she was crying and the other half she was moaning. However you look at it, she was miserable (and still is). She was very tense and on edge all day today. Lots of moaning and fussing. She was still having lots of movements, clawing at her arms and crunching her body in half over and over again. She didn't really take any long naps today, just the occasional cat nap that ended with her startling awake and miserable once again. She did have two poops (very out of the ordinary for her and possibly indicating a stomach virus of some sort) and she had four big throw ups. The suction pump hasn't been as helpful as I had hoped. It's difficult to maneuver when you're already holding her in your lap (need more hands)...today we just used the old method of just wiping it out of her mouth with a blanket. And each time it was a pretty big amount of foamy spit. Such a miserable feeling to throw up, I hate seeing her have to go through that. She just looks so pathetic and so sick. I feel so bad for her. We definitely need continued prayers...prayers for health, prayers for happiness, prayers for sleep, and prayers for no more throw up! What a night. To say Reagan didn't sleep well is an understatement. She fell asleep by 10:30pm with the help of clonidine. I went to bed around 11:30 and she was awake by 12:30. She was up and she was not a happy camper. We watched some tv and finally she was back down by 2am. Then 3am, she was back up with lots of crying. This time she woke both Grandma and Daddy. The whole house was up! With Grandma's help she was back in bed by 4am but then woke for good at 6am. Not a good night. We are all sooooo sleepy. Reagan has continued to be miserable all day today...no sign of smiles or happy today. This afternoon we decided to go ahead and take her in to get some bloodwork (just in case something is off) and while were were there we stopped by the pediatrician's office. Reagan was running a low grade fever and still very irritable. The doctor did see a "blister" in the back of her throat that might be causing some of her irritation...but overall we're still not sure what's bothering her. Tonight she threw up a couple times...maybe her throat is bothering her. Days like these feel like wasted days. We start the day just hoping to get through it. Reagan's just so tense. You can't interact with her at all. You can't even look at her without her losing it. Her little body is so stressed...I only wish we knew why. It's a helpless feeling. She needs sleep...that little body needs to recover and get healthy again. Please continue to keep her in your prayers. Here she is "crunching" she's so tense. This is the pouty face...just before a crying episode. Reagan slept well and woke up this morning still happy but having lots of movements. More clawing at her arms and now she's moving her legs around more too. Yesterday we noticed the cold, clammy hands and feet again and they've been just as bad today. She's definitely more on edge...still happy and very smiley but more tense. She's laughed some today but it's the crazy laughs, not necessarily the happy laughs. All of this is what we tend to see before she gets sick...although there have been a few times that she's managed to pull back out of it without getting sick. I pray this is one of those times. Grandma is coming in tomorrow and I know she really wants to see a happy Reagan. We all do. Please keep it in your prayers that she can get over whatever this is...sooner rather than later. Reagan has had another good day today. She slept well and woke smiley once again. Other than being a little congested in her nose, all is good. She only had one therapy today...and that was OT. She has OT Tues/Thurs with one therapist and Fri with another therapist. This was only our second visit with this therapist, so she's still getting to know Reagan. All went well though. After therapy she took a 45min nap...not like her but she woke feeling refreshed and spunky. 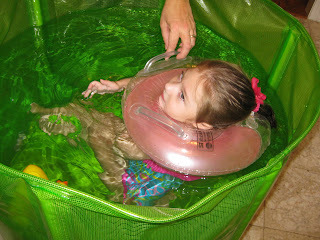 Then this afternoon we filled up the pool and let her swim again! 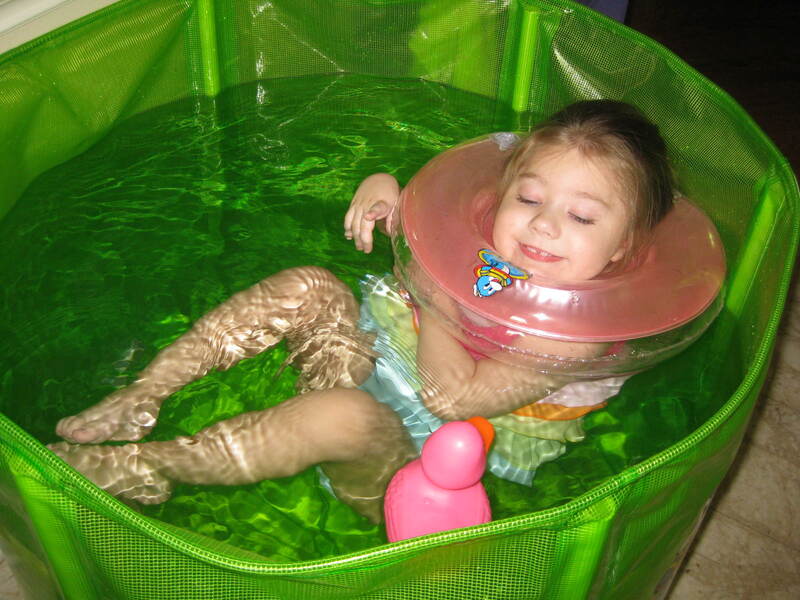 Today she was a little more laid back in the pool but she was smiling the entire time! Today has been a better day for Reagan. She slept through the night last night (good for all of us) and then woke up this morning with smiles. So glad to see some smiles. And some laughs and happy sounds too. All good things. Of course the chorea in her arms has picked up a little again, but I'm just glad to see a happier girl. She had both OT and PT today and they both tried out our new therapy swing. Reagan really seemed to like it. 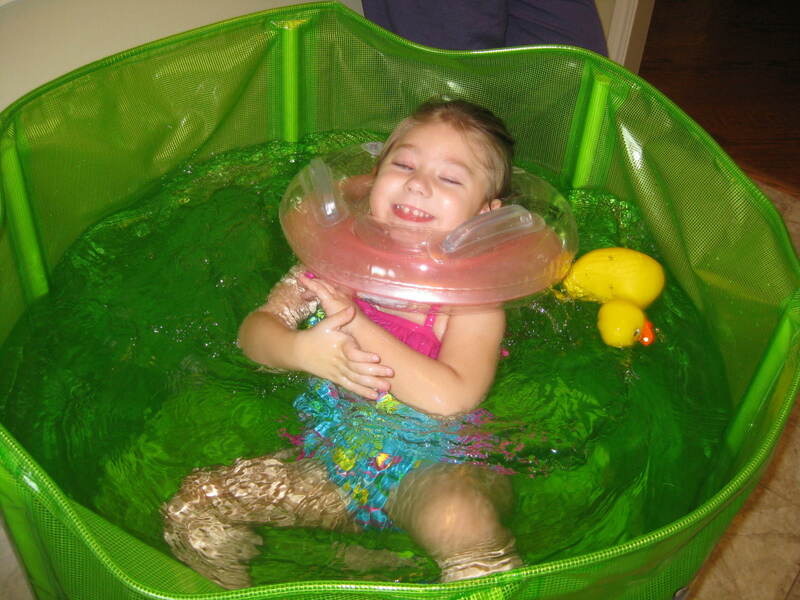 We spoke to Reagan's OT today about doing some water therapy with her (we knew she was doing it with another patient) and our Wed/Thurs/Fri nurse has a pool and lives just down the road from us. So next Thursday we are going to give that a try (weather and Reagan permitting). Right now it's bedtime and Reagan is just sitting here still smiling from ear to ear. An answer to prayers. Here's to another good day tomorrow! Reagan continues to be a little off. It's not that she's fussy, but she's just not happy. Very serious. Disinterested. And still (which I'll take any day over the crazy chorea). She had both OT and PT today but she was not an active participant in either. 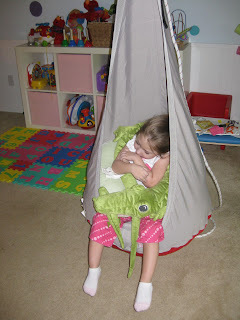 We did finally try out her Ikea Ekorre swing. We've had this swing for a year or so but haven't used it until today. Now, thanks to Mike, we have a good sturdy hook to hang it from (Mike wedged himself in the swing this weekend to test it out). When Reagan's OT put her in it, she was expressionless but she definitely didn't seem to mind it. 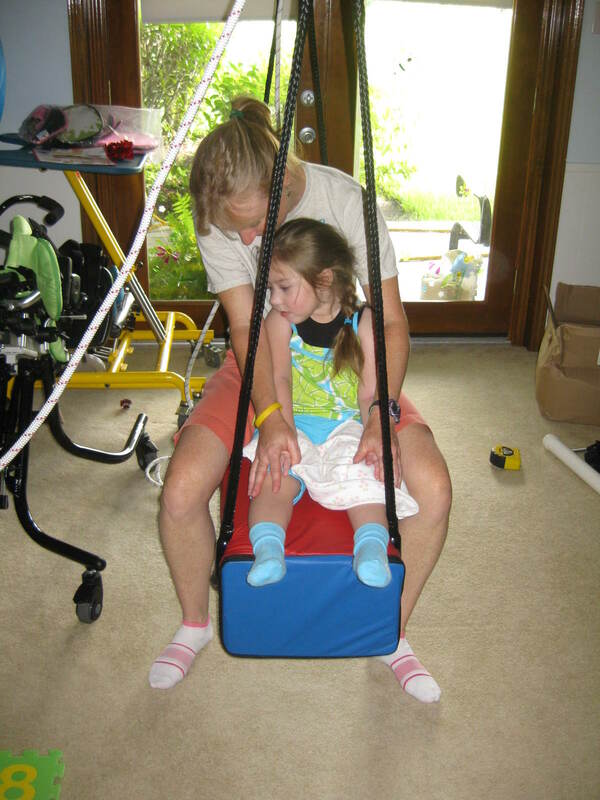 Then at the end of PT her therapist put her in her new stander. I wasn't sure how well she'd do in it in this mood, but we kept her attention with the ipad for a good 45min and then took her out. I have to admit we haven't been using the ipad for communication purposes just yet but the apps she does have are all educational in some shape or form. I did find a new favorite app today. It's called fish school (by duck duck moose). It's the cutest thing. It uses little fish to spell out the alphabet, numbers, and shapes. It also sings the alphabet, teaches colors, and has a matching game. It's a very cool app...well worth the $1.99. Reagan wasn't as excited about it as I was but maybe when she's in a better mood she'll be more interested. Tonight Reagan had another throw up incident. She was on Mike's lap, one second she was fine, next second she was puking. We had the suction pump right beside us and I immediately whipped it out but I couldn't get it to suction anything. I couldn't figure out what was going on. Apparently there's a little hole that you have to put your thumb over in order to get suction...I didn't realize that. Oops. I guess we'll have to give it try it next time. Problem is, I wish there was no next time. I don't know why she's doing this again. She went all week last week without even one incident. We definitely need some continued prayers in this area. Today has been an off day for Reagan. She slept well last night waking at 7am this morning with another major blowout. Thank goodness for washable bed pads! She made a few gaggy faces this morning so I wasn't so sure about taking her to feeding therapy but she seemed better after a while so we gave it a try. 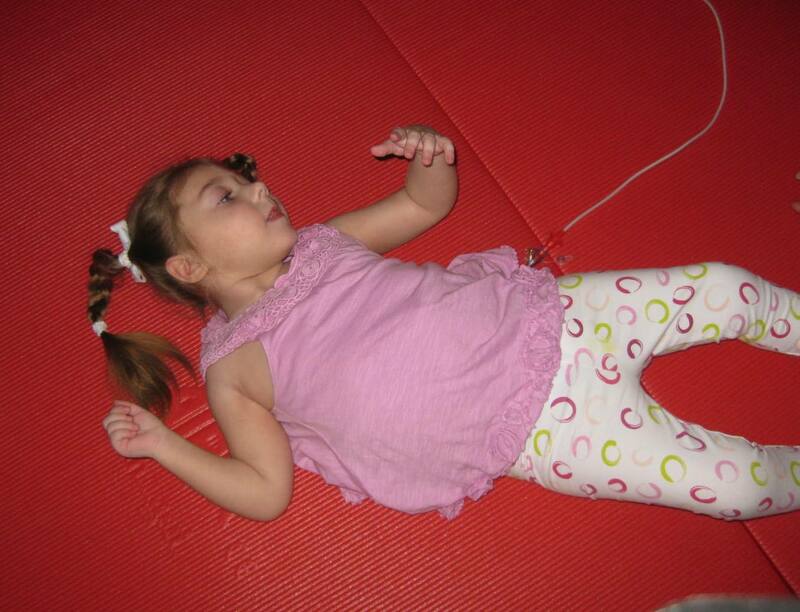 She fell asleep right before we got there so her therapist started off with some stretching and eventually Reagan woke up. She actually woke up with the giggles...which was awful cute. She had a little applesauce and even chewed on some dried mango. Then we came back home and she just took it easy. She was still very serious and quiet most of the day, although she did throw some laughs in here and there. Then tonight I was cooking dinner, she was laying on the floor and I could tell she was getting antsy. I walked out of the room for just a second and I heard a gagging noise (I actually thought it was the dog at first), I ran into the room and she had thrown up all over herself. Of course the suction machine was no where near me so we just had to make due. An hour or so later Mike was holding her and she threw up again. Poor thing...two big throw ups. She just looked miserable...and tired. Not sure where this nausea came from but I sure hope it goes away. Please continue to keep her in your prayers! Mike is home...he got back from Canada this morning around 8am. Reagan slept well again last night...thank goodness. I have to admit, I had my doubts. She was just so hyper and talkative last night I was afraid she was never going to go to sleep. But 10min after the clonidine, she was out! It's funny, how medications seem to work so well on her when she's healthy but the second she gets sick, nothing works! She's been in a great mood again today, "talking" and squealing up a storm. She does it more when you're right beside her or holding her, it's like she's really trying her best to communicate with you. Mike and I were talking tonight, when Reagan is like this it's hard to imagine how bad things get sometimes (like last weekend)...and when things are bad it's hard to imagine how good things can be (like this week). It's even more hard to imagine that you can have such horrible days followed by such wonderful days. This girl...always keeping us on our toes. 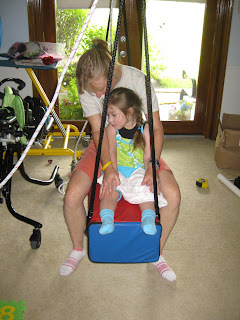 Her stander was finally delivered today. I spoke with someone from another equipment company and they told me that when Reagan outgrows this stander (even if it hasn't been a full 5yrs, which it won't), Medicaid will still pay for another as long as we have documentation that she's outgrown it. So we decided to just stick with the Leckey Squiggles Stander we had already ordered...it fits her like a glove (so much better than her other stander). Of course there was still a problem. They had ordered the wrong tray, so they had to take it back and reorder a new one. Hopefully that will get taken care of fairly quickly so she can begin using it. Please keep us in your prayers for a nice uneventful weekend, we certainly need it. Reagan slept in a little today...she didn't wake up til 9:30am. I love it when she sleeps, but sleeping in always makes me nervous. She woke up feeling spunky today...not nearly as calm as she was yesterday. More movements (which I'm not happy happy about) but still sweet and smiley. 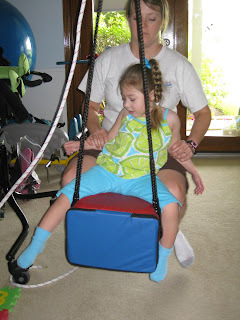 She had PT this morning and then did some time in her stander. Her OT was sick on Tuesday so we passed on a visit today, just to be on the safe side. We did take her for another spin in her waterwaybabies pool though. I love the way she's able to move around in this thing but I hate that it's such a pain to fill up and empty out (not to mention all the water we're using each time). She enjoyed herself though and was extra spunky tonight. Lots of babbling and squealing. I finally had to get my Dad to video some of it because it was just too cute (make sure you pause the blog music at the bottom of the page so you can hear her "talking"). Reagan has had a great day today. She slept through the night last night (good for everyone) and she's been all smiles all day long. First thing this morning we went in for her abdominal ultrasound. She was great the whole time. Not sure what if anything the ultrasound will show but they said they won't have the report to the doctor til Friday. We came home and just took it easy. No therapies today and summer school is over so not a lot going on. Reagan's been much more calm today. Less movements, definitely more relaxed. And did I mention the smiles? Smiling all day long. So good to see that. Today they delivered Reagan's suction machine (sure wish we would have had that on Sunday). It took a while for her pediatrician's office to finally send the orders but once they finally did, the process was pretty quick. To my surprise our primary insurance actually approved it so we didn't even have to go through medicaid. We don't plan on using this on a regular basis, but it sure will be nice to have when we need it (hopefully we won't need it for a while). Please continue to keep Reagan in your prayers...we need more good days! Last night we gave Reagan one hour to improve or we were going to the ER. We gave her a dose of clonidine and waited. Amazingly enough the clonidine seemed to help her nausea (I think because it calmed her down) and within the hour she settled down and started looking sleepy. She fell asleep and slept through the night (thank you God). This morning she seems improved (thank you everyone for your prayers). She's still off and looks rather pathetic at times, but the movements have definitely lessened (see video below) and we've only seen gaggy faces (no actual gagging). We took her in to the pediatrician this morning and she ordered a bunch of labs (all of which came back normal). She said Reagan's tummy was making lots of gassy noises and if we didn't see big improvement by tomorrow, she wanted her to have an abdominal ultrasound to check everything out (scheduled for Wed am). It's a little frustrating because we still have no clue what could have caused all of this. We took her back off both meds we started last week (the antibiotic and Singular) just in case either of those were contributing but more or less we're still clueless. 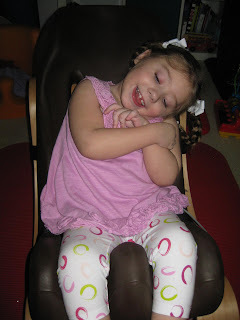 We have seen some glimpses of our happy girl today...she's actually connecting with you when you talk to her and we've even gotten some smiles out of her (such a huge improvement to the completely unresponsive girl from this weekend). I'm so glad that she seems to be improving (definitely an answer to prayers) especially since Mike is leaving the country tomorrow to go to Canada for business. How's that for timing. Please continue to send some extra prayers up for our little one...they're working. 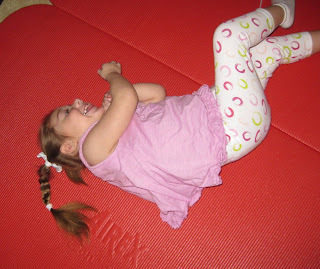 I've mentioned Reagan's chorea (uncontrolled movements) many times but I don't think I've ever posted a video to actually show you what I'm talking about. This video is from yesterday...I spared you the vomiting but she does make the gaggy face a couple times. This just gives you an idea of what I'm talking about (although you can't really get the full picture unless you hold her an feel the full force of these movements and how difficult it is to stop them). It's been another horrible day. Horrible. Reagan was up all night last night. She didn't sleep a single wink. I was up with her half of the time and the other half she was in our bed, kicking, squirming, gagging and whacking me in the face. It was a horrible night...and a horrible day followed. The chorea/movements have been out of control and she's been vomiting, retching and choking all day long. Seriously...this is the worst nausea I think we've ever seen out of her. It's unrelenting and painful to watch. I've been in tears all day. I just can't take this anymore. I feel totally and completely helpless. I can't do anything to help her. If we could only get her to go to sleep, at least she'd have some sort of relief from the constant movements and nausea. We've considered taking her into the ER (I actually even have our bags packed), but we were in patient for an entire month last year because of her nausea and there wasn't a single medication they gave her that helped in the least. I just don't know what to do. I'm losing it right now. Prayers are desperately needed. Prayers for sleep and a stop to this nausea. Last night was a good night. 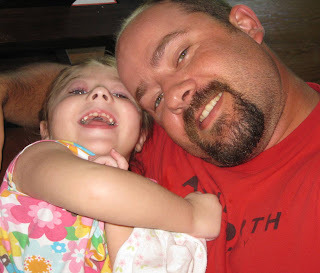 Reagan was giggling up a storm when Mike got home (just in response to hearing his voice), it's good to see her loving her Daddy again. I was a little worried because only moments after laying her down last night, she was back awake. Thankfully she didn't fuss and even though she had a hard time staying asleep, I think she finally dozed off and slept the whole night through. Today she's had moments of being completely content and then moments of being fussy, stressed out and tense. She's also taken a couple naps which is way out of character for her (but appreciated when she's fussing). I'm hoping the antibiotic she started yesterday will kick whatever sickness she's been fighting so she can settle down and get back to her happy, healthy self. It's so frustrating...it seems like we're back to the point where we just can't get her to stay healthy for more than a couple days. We need more than a few good days in a row. I spoke to her mitochondrial doctor this week (emailed) and let her know of my frustration. She wants to see Reagan sooner than her scheduled December appt. They moved her up to Aug 31st, so I'm hoping we can come up with some sort of game plan to get Reagan on the right track. Prayers are certainly appreciated. Reagan fell asleep last night at 9:30pm...she was pretty cranky, I'm guessing she was just exhausted from the lack of sleep. Then she woke crying only an hour later but Grandma rocked her and got her back in bed by 11pm. I woke up at 5am to take my mom to the airport and I was thrilled when I realized she was still asleep. I came back home, went back to sleep, got up and gave her all of her medicines...and she was still asleep. She actually didn't wake up til 11:30am and that was with some help from me. She seemed happy when she first woke up, we got her dressed and fixed her hair but the crankies set back in. Her OT came to work with her and Reagan cried most of the time. She was having some gas though so that was probably part of it. 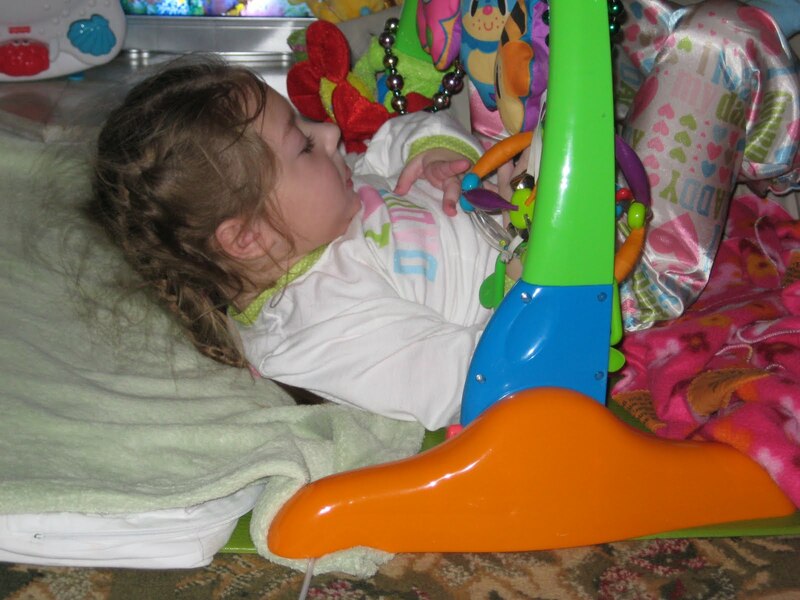 Her OT finished up with Reagan laying on her side and quite content...the next thing we knew she was back asleep. She slept there for the remainder of the day. Not sure what this means for tonight. She could either sleep the whole night through or wake up in the next few hours and stay up all night. Let's pray for sleep. I don't know if she's sick and trying to sleep it off or what. I'm glad to see her sleeping but at the same time it's A LOT of sleep and I know it's probably because she's sick. With what, who knows. I've already made an appt with her pediatrician for tomorrow. We'll see how she's doing tomorrow but we'll probably be going in just to get her checked out. One concern I do have is that Reagan has been waking coughing lately. She only does it when she wakes up, but it still makes me nervous. 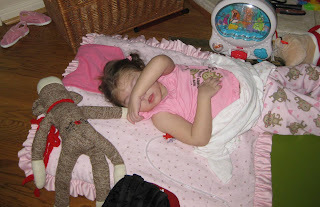 I spoke to her pediatrician over two months ago about getting a suction machine for her...especially for those gaggy days when she throws up multiple times. Her instinct is to swallow it back down instead of spitting it out. I'm in constant paranoia about aspiration. I've just heard of too many kids that are healthy one day and gone the next because of aspiration pneumonia. Scary. Please keep it in your prayers that we can get Reagan healthy and keep her that way. A mouth breather just like mommy! A video from last night...Grandma making Reagan laugh (sorry it's so dark). Last night was a doozy. Reagan was so fussy and gaggy, not a good combination. 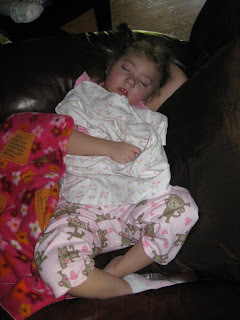 She fell asleep around 10:30 (with the help of 1/2 pill clonidine), then she was awake again a little after midnight. I got up with her and watched some quality late night tv but she was not getting tired and she was progressively getting more fussy. Everyone in the house was up at some point. Grandma got up for a little while at the beginning and then went back to sleep until she heard more cries around 3am. Thank God for Grandma because Reagan was just not happy with me. She was better for Grandma and fell fast asleep in the rocking chair by 4am. Unfortunately she only slept til 7:30am but she did wake in a better mood...still a little on edge but definitely less gaggy and a little less fussy. Less fussy during the day that is...tonight she went crazy again. Lots of crying. We're all running on empty here. I'm not sure how much longer we can take this. Nonstop crying and no sleep for any of us. I don't know what is wrong with her...why is she so upset? When are things going to get better? Please say some extra prayers for our little one...we need her healthy ASAP. Last night I reduced the Clonidine dose (Reagan hasn't been sleeping much on 3/4 pill, but I didn't want to just stop it altogether either)...and with the reduced dose she actually slept better! She slept from 11pm-5am. I was glad to just get a string of consecutive hours together of sleep. Of course, she was wide awake at 5am! It's funny she actually woke saying Ga! I haven't heard her say Ga Ga in quite a while and today all of a sudden she's said it 10+ times (even before Grandma got here)...it was like she knew her Grandma was coming today! Her mood has been pretty good, that is except when Mike takes her. The last couple days she's really been giving her Daddy a hard time. She'll be fine and then he'll take her and immediately she'll get the big lip and frowny face and start crying. No clue what that's all about...usually she's a Daddy's girl. Today Reagan's had several dirty diapers (very unlike her) and been extremely gaggy all day. She's been super nauseous, retching and making gagging faces nonstop. She's super sensitive, just giving her a kiss on the cheek can trigger a retch. She threw up three times tonight...but it didn't seem to give her any relief. How she's throwing up so much (with no food in her stomach), I don't know. And then now she sounds all junky in her throat...worries me. Poor thing. Please pray that this nausea passes. She's also still having a lot of movements. Sometimes you pick her up and she kicks her legs around so much it's hard to hold onto her...it's almost like she's having fits of the chorea where it escalates and then tapers back down. We already have the new medicine (tetrabenazine) to try for the chorea but I'm just nervous about trying anything new. We've got enough problems to deal with right now without adding a new med and side effects to the mix. I'm not sure what to do about it. I'm still on the fence. Looking cute, but about to make a gaggy face.